Should You Wash Face In Sink Or Shower? Let's Reveal The Truth! Should You Wash Face In Sink Or Shower? Let’s Reveal The Truth! What is the basic rule of getting a clean and flawless face? Cleansing and washing it from time to time. In fact, washing the face is probably the simplest part of our daily beauty regimen. Some of us feel comfortable in washing the face under the shower while others prefer practicing at the sink by making some extra efforts. But have you ever thought that your habit of washing your face over the sink or under the shower can actually impact your appearance? Yes, you just can’t wash your face just anywhere for the sake of the health of your skin. This post is going to reveal the truth about whether you should wash face in sink or shower. How To Wash Your Face Over The Sink? 1. First of all, make your face free from your hair. You can pull back all your locks and tie them up into a neat bun or a high ponytail by using an elastic band. You can also use a headband to keep your bangs or fringes away from your face. 2. Take some water in your hands and splash it over your face. As soon as your entire face gets moistened, cleanse it with a gentle facial cleanser. You should apply the cleanser all over your face and cleanse thoroughly by moving your fingers in a circular motion. 3. Exfoliation is also an important part of washing our face. So, choose a gentle facial scrub that contains tiny beads and exfoliate your face slowly. Once done with it, rinse your face by splashing fresh water. Make sure that you do not ignore areas like hairline, jawline, both sides of the nose, etc. while washing your face. 4. Pat dry the face gently with the help of a soft clean towel. 1. It is somewhat difficult to keep the hair away from the face while washing it under the shower. So, you can wear a shower cap to cover your entire head prior to getting into the main job. If you are also taking a shower, simply rinse your locks back. 2. There is no need to splash water over your face as you are standing right under the running water. Just wait for a few minutes so that your face gets wet completely. 3. Now, cleanse it with the help of a mild facial cleanser. The process of cleansing must be similar to the previous one. If you need to exfoliate your face, follow the earlier method once again. 4. Rinse your face thoroughly and then pat dry with a soft clean towel. The whole process of washing the face becomes a relaxing one while done in the shower under running hot water. Though it opens up the pores and facilitates deep cleansing, the natural oils of your skin also gets stripped off at the same time. As a result, it becomes dry, patchy, and flaky. The bar soap used in the shower should never be used for washing the delicate facial skin as it is too drying and takes a toll on the pH balance of your skin. If you keep using the same, you may end up developing severe breakouts or allergies. While washing your face at the sink, gauge the temperature of the water and adjust it according to the needs of your skin. This prevents the skin from getting too sensitive and helps you stay away from redness. 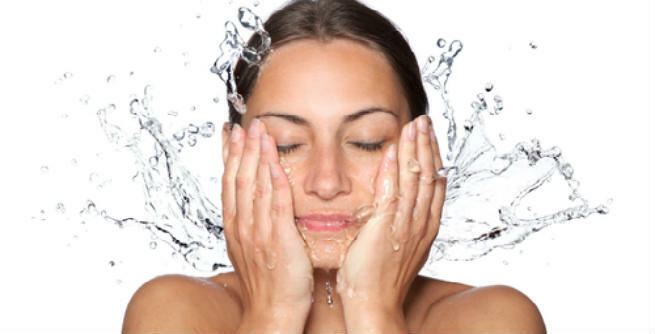 Using lukewarm to cold water is the best for your skin and washing the face at the sink can make it easier. Always apply a burst of cold water while finishing the process as it will boost the flow of blood throughout the facial skin, thereby giving you a healthy glow naturally. Washing the face at the sink involves a gentle massage, which facilitates deep cleansing by opening up clogged skin pores. Take your time to apply the cleanser properly so that you can make the most of it. It is quite clear from the above point that sink is better than shower for washing face anytime. However, the shower works as a huge steamer for our face, which liquefies the sebum entrapped in our pores and helps in opening them easily. This can lead to a great cleansing as well as washing session when the right guidelines are followed. Make sure that you do not use too hot water. Also, ensure that you do not wash your face for too long even if you are using lukewarm water only.